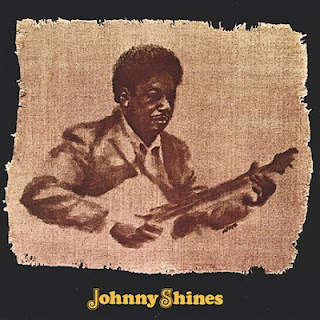 TUSCALOOSA, AL — Johnny Shines will tell you, "If you didn't have the blues yesterday, look out for them tomorrow, if you don't have them now because they're as certain as death." Shines is a 61-year-old delta blues singer and guitarist who lives in Holt, a working class suburb of Tuscaloosa. 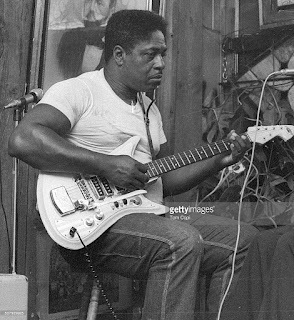 Like many blues musicians, Shines laid the foundation for modern soul and rock music, but he has never received any recognition. The delta blues, according to Shines, are the gut bucket blues, as opposed to the Chicago blues, which are more brassy. 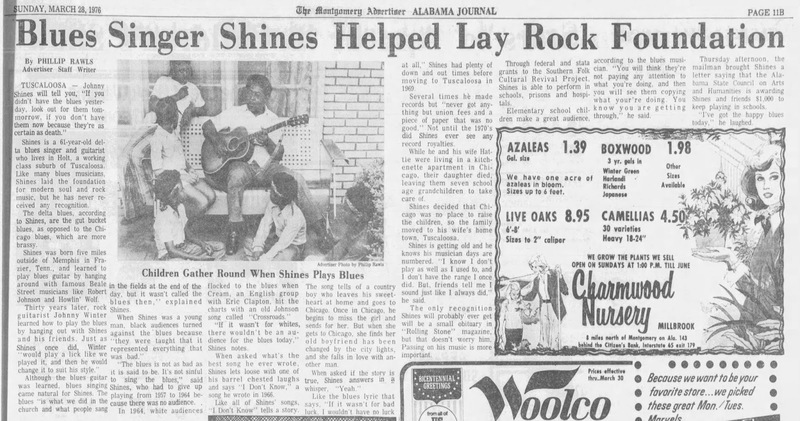 Shines was born five miles outside of Memphis in Frazier, Tenn., and learned to play blues guitar by hanging around with famous Beale Street musicians like Robert Johnson and Howlin' Wolf. Thirty years later, rock guitarist Johnny Winter learned how to play the blues by hanging out with Shines and his friends. Just as Shines once did, Winter "would play a lick like we played it, and then he would change it to suit his style." Although the blues guitar was learned, blues singing came natural for Shines. The blues "is what we did in the church and what people sang in the fields at the end of the day, but it wasn't called the blues then," explained Shines. 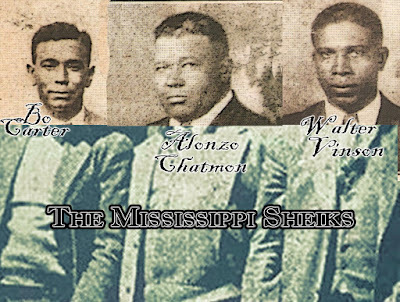 When Shines was a young man, black audiences turned against the ' blues because "they were taught that it represented everything that was bad. "The blues is not as bad as it is said to be. It's not sinful to sing the blues," said Shines, who had to give up playing from 1957 to 1964 because there was no audience. In 1964, white audiences flocked to the blues when Cream, an English group with Eric Clapton, hit the charts with an old Johnson song called "Crossroads." "If it wasn't for whites, there wouldn't be an audience for the blues today," Shines notes. When asked what's the best song he ever wrote, Shines lets loose with one of his barrel chested laughs and says "I Don't Know," a song he wrote in 1966. Like all of Shines' songs, "I Don't Know" tells a story. The song tells of a country boy who leaves his sweet-heart at home and goes to Chicago. Once in Chicago, he begins to miss the girl and sends for her. But when she gets to Chicago, she finds her old boyfriend has been changed by the city lights, and she falls in love with another man. When asked if the story is true, Shines answers in a whisper, "Yeah." Like the blues lyric that says, "If it wasn't for bad luck. I wouldn't have no luck at all," Shines had plenty of down and out times before moving to Tuscaloosa in 1969. Several times he made records but "never got any-thing but union fees and a piece of paper that was no good. Not until the 1970's did Shines ever see any record royalties. While he and his wife Hat-tie were living in a kitchenette apartment in Chicago, their daughter died, leaving them seven school age grandchildren to take care of. Shines decided that Chicago was no place to raise the children, so the family moved to his wife's home town, Tuscaloosa. Shines is getting old and he knows his musician days are numbered. "I know I don't play as well as I used to, and I don't have the range I once did. But. friends tell me I sound just like I always did," he said. The Anniston Star, Apr 20, 1992. The only recognition Shines will probably ever get will be a small obituary in "Rolling Stone" magazine, but that doesn't worry him. Passing on his music is more important. Through federal and state grants to the Southern Folk Cultural Revival Project, Shines is able to perform in schools, prisons and hospitals. Elementary school children make a great audience, according to the blues musician. "You will think they're not paying any attention to what you're doing, and then you will see them copying what you're doing. You know you’re getting through,” he said. Thursday afternoon, the mailman brought Shines a not letter saying that the Alabama State Council on Arts and Humanities is awarding Shines and friends $1,000 to keep playing in schools. "I've got the happy blues today,” he laughed. The Montgomery Advertiser, Mar 28, 1976.